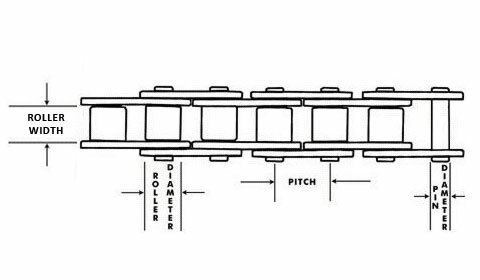 To determine the pitch (chain size), you'll need to measure the distance between any consecutive rivets. The rivets are the small, round pegs/studs that hold the chain segments together. Measure from the center of the first to the center of the second. 41 1/2" .306 1/4" .141"
420 1/2" .306 5/16" .156"
428 1/2" .312 1/4" .187"
40 1/2" .312 5/16" .156"